Pollarding tress: "the cyclical removal of tree growth above 2 metres"
Many ancient trees in this country have a pollard history but their pollarding stopped a long time ago. This was for a variety of reasons such as replacing wood fuel with coal and removing commoner’s rights in the 1773 Enclosures Act. With the passing of generations, the techniques for successfully managing these trees have been forgotten and lost in time. At present a new generation of pollarded trees is being created at only a handful of sites in the country and often on an experimental basis. The chances of seeing these new pollards on well known ancient tree sites is almost as rare as seeing the endangered fauna and fungi that inhabit the ancient pollards of the past. Despite pollards being part of our country’s heritage as a cultural landscape practice, they do not receive the attention and conservation they deserve. Attempts at revival of the forgotten practice are often met with cynicism by site managers and the general public who perceive cutting trees while young and healthy as a negative action. 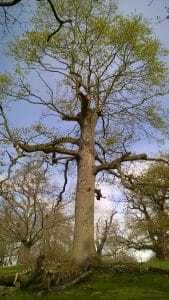 However, this intervention is likely to be the catalyst for the saviour of biological communities associated with decaying wood as well as creating the oldest living and most visually charismatic trees. 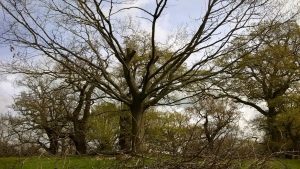 The Ancients of the Future Project is actively researching, advising and undertaking practical works for the continuity of pollarded trees at important sites like Moccas Park in Herefordshire. The necessity of pollarding at Moccas Park is paramount due to the associated status of nationally endangered invertebrate species living there, one of which inhabits just a handful of ancient pollarded oak trees, the Moccas Beetle Hypebaeus flavipes. By using a variety of tree species and cutting techniques Moccas Park is attempting to provide a range of habitats within trees for the next generation of invertebrates, fungi and lichens. Tree species react differently to pollarding and subsequently provide a range of conditions which in turn support very different decaying wood communities. The conditions and communities are dynamic during their development but it is often in the latter part of a trees life that they harbour iconic species such as the Cardinal Click Beetle Ampedus cardinalis and Beefsteak Fungus Fistulina hepatica. Experimental techniques to try and create these varieties of decaying wood are used and will be recorded by the Ancients of the Future Project. Due to the loss of knowledge about pollarding, many of these pollarding techniques have been developed by arborists working within the urban environment. This is because regular tree pruning is necessary but the retention of scarce trees is equally valued. In London it can be said that when walking the streets you are more likely to see regularly cut pollards than at well known ancient pollard sites. There needs to be a cultural shift in the recognition and creation of a new generation of pollards across the country if we are to preserve all the endangered species and landscapes associated with ancient trees, as well as creating big old gnarly visually stimulating trees for future generations to enjoy.